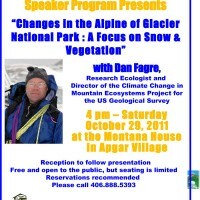 The Montana House and the Glacier National Park Fund are pleased to co-host a presentation by Dan Fagre, PhD., from the USGS Science Center in Glacier Park. 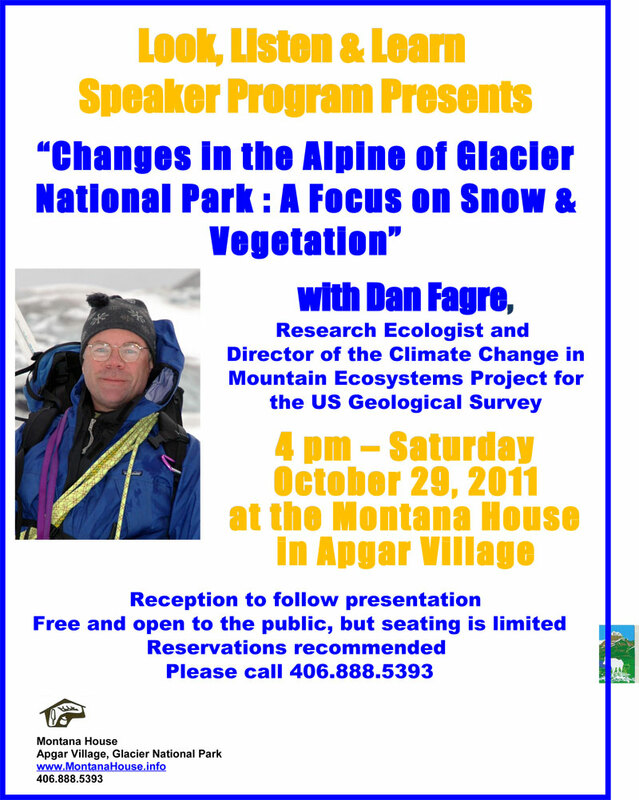 The event, “Changes in the Alpine of Glacier National Park: A Focus on Snow & Vegetation,” will be at 4 pm Saturday afternoon, October 29th at the Montana House in Apgar Village. His talk will highlight tree-ring studies on snowpack trends for the past 900 years and results from summit vegetation research. Dr. Fagre is Research Ecologist for the Northern Rocky Mountain Science Center and Director of the Climate Change in Mountain Ecosystems Project. Stationed at Glacier National Park, Montana, he is also faculty affiliate at the University of Montana, Montana State University, University of Missouri-Columbia, University of Arizona and several other universities. He has worked for the past 20 years with many staff, partners and collaborators in the Northern Rockies to understand how global-scale environment changes will affect our mountain ecosystems. Fagre helped establish the Western Mountain Initiative, a program to tie mountain science across different areas, and is active in several international science networks that address mountain issues. He served on the Montana Governor’s Advisory Board for Climate Change, and recently was lead author for a commissioned report to the President and Congress through the U.S. Climate Change Science Program. He received the Director’s Award for Natural Resource Research from the National Park Service and a National Special Service award from the USGS Director. He is an author on more than 130 publications and has co-published three books recently. The presentation at the Montana House will be at 4 p.m. with time for questions and a reception to follow. The event is open to the public without charge, but seating is limited, so reservations are needed. Please call 406-888-5393 for additional information and to reserve your seats.